Lightly snow covered mountain peaks and lush green meadows of the Blakiston Valley along the Red Rock Parkway in Waterton Lakes National Park in Southern Alberta. The view from your campsite at the Crandell Campground in Waterton Lakes National Park in Southern Alberta, Canada is of the beautiful mountains and lush green meadows of the Blakiston Valley. 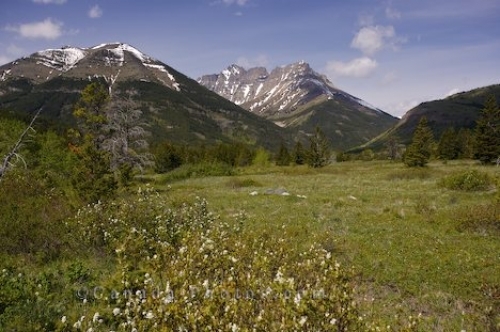 The Blakiston Valley is a beautiful place for hiking and exploring the countryside that surrounds Southern Alberta. Mountains and meadows seen in the Blakiston Valley from the Crandell Campground along the Red Rock Parkway in the Waterton Lakes National Park, Southern Alberta, Alberta, Canada. Picture of the mountains and greenery in the Blakiston Valley from the Crandell Campground in Southern Alberta, Canada.